Toilet fill valve (ballcock). The hose outlet (A) must be at least 1 inch higher than the overflow pipe (B). This repair has nothing to do with the water level in the tank. Click here for more details. Cleanout plug in the side of the floor drain. The cleanout plug must be tight-fitting. If there are still good threads in the hole, you can use a new plastic plug as shown. 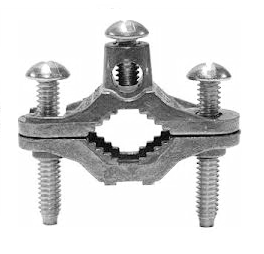 If the threads are rusted, use a plug with a butterfly nut as shown. The floor drain must drain normally (quickly) with the cleanout plug in place. Test by pouring a gallon of water in the drain. It should drain about as fast as a sink drain. GFCI outlets (the kind with the buttons). They should trip off (no power) when the test button is pushed. If they don’t, they are either wired wrong or the outlet is defective. Elevated loop on the dishwasher drain hose. The loop must be higher than the bottom of the sink as shown. This prevents water in the sink from being siphoned back into the dishwasher. Backflow preventer (left:) A typical backflow preventer for the laundry sink faucet (not the washing machine hoses) and the outside hose faucets. Screw tightly onto the faucet, check for leaks, then tighten the set screw until it breaks off. The set screw prevents it from being removed later. Right: Two examples of outside hose faucets that do not need a backflow preventer added. They have the anti-siphon feature built in already. Note the round piece on top. 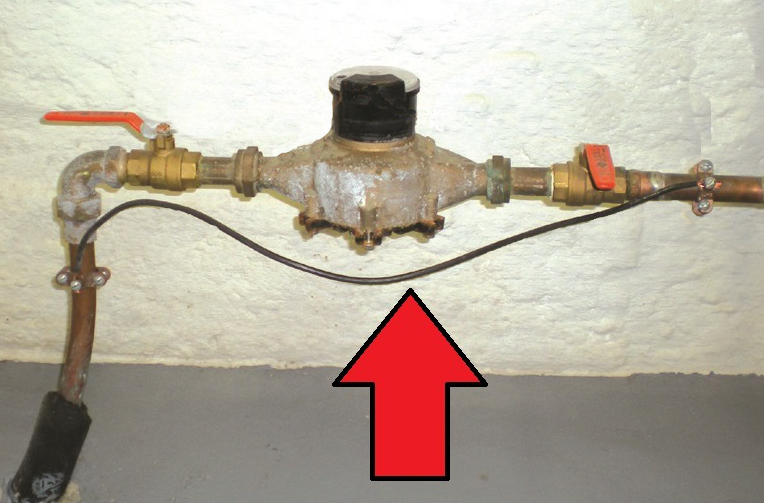 A grounding jumper wire should be clamped on both sides of the water meter. This allows the house’s electrical system to stay grounded even if the water meter is removed. Use approved grounding clamps as shown, mounted outside the water shutoffs. 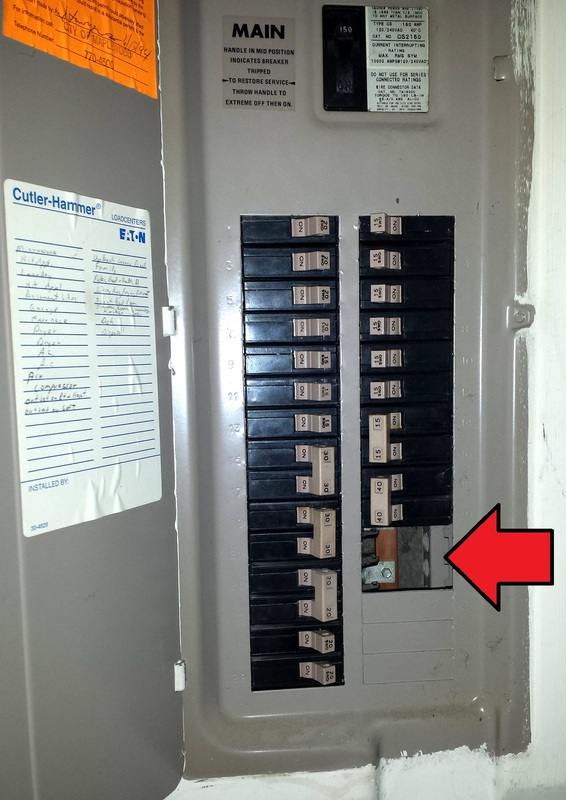 Use #6 gauge copper wire if your electrical panel is 60, 100, or 150 amp. Use #4 gauge copper if it’s 200 amp. Discharge pipe on the water heater. Must be metal, not plastic, and the same diameter as the relief valve it’s attached to. 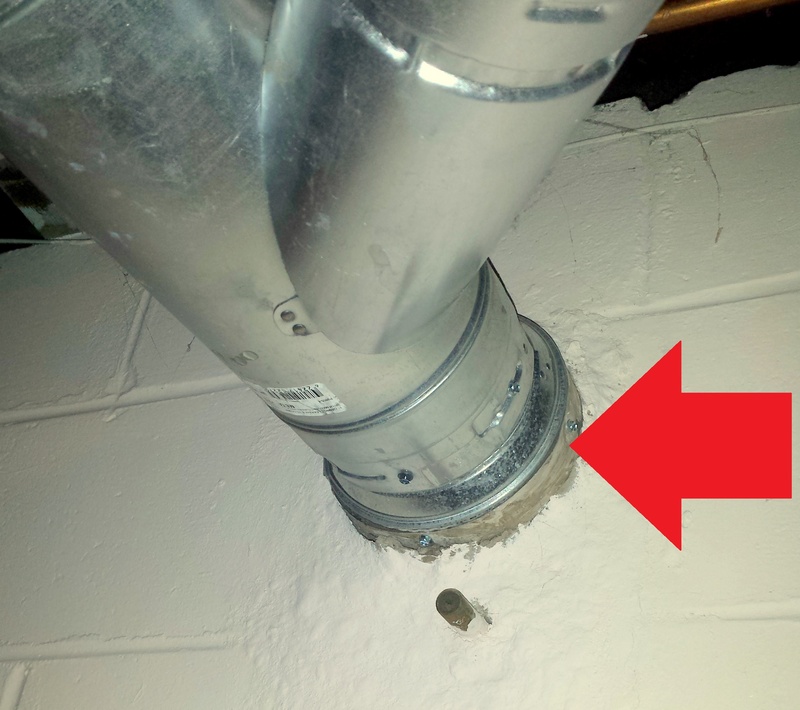 The bottom end must be 6” to 18” above the floor, with no threads on the end (threads could allow someone to mistakenly cap the pipe, a dangerous situation). Exposed wires (missing junction box cover). Bathtub faucet below the rim of the tub (incorrect). This can allow tub water to be siphoned back into the water supply. Here are two examples showing the bathtub faucet above the rim (correct). 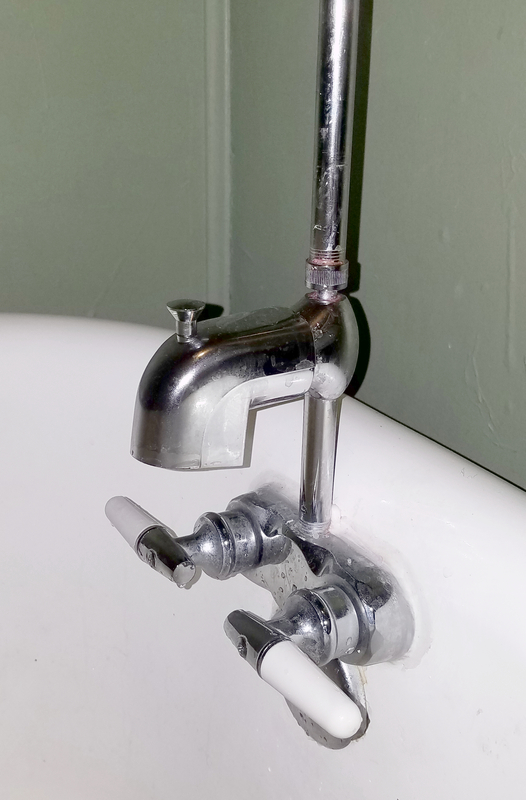 An alternative fix is to install check valves in the water lines to the tub. Installing check valves requires a plumbing permit. Flues not tightly cemented to the chimney (usually in the basement). The furnace and water heater flues must be tightly cemented where they enter the chimney. Must be airtight. Empty breaker openings in the electrical panel. Must be capped with approved caps. Empty fuse sockets must also be capped.